Groups of people are getting together around the world to celebrate International Women’s Day this Thursday. In many different countries they are marching with signs, having big meetings, and even stopping work for the day. International Women’s Day (IWD) is a day to celebrate women. The day reminds people that the work of women is important, that women face special problems, and that women are still not treated fairly in many places in the world. IWD is celebrated on March 8 every year. Usually it is celebrated with marches and rallies. 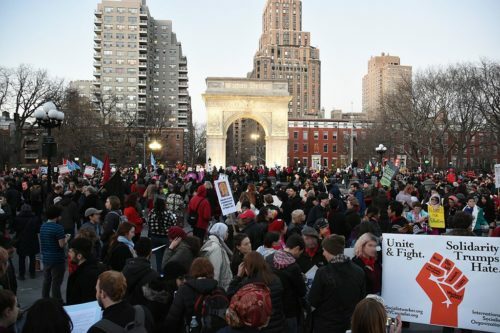 A rally is when a large group of people gets together to support or to protest against something. Many changes have happened in the world in the last year. Women in countries such as Saudi Arabia have more freedom now than they have ever had before. Many countries now have female leaders for the first time. And in the last year, women around the world have told stories of how they were treated badly. These were stories that most women thought they had to keep secret before. 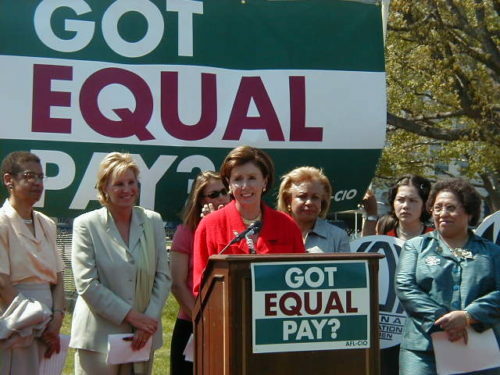 Congresswoman Nancy Pelosi speaks on Equal Pay in 2002. The IWD rallies celebrate these good changes. But they also point out that more changes are needed. For example, equal pay. In most countries, women usually earn less money, even if they do the same work as a man. Marches were held in many countries in Asia, including South Korea, India, and the Philippines. In Sweden and about 50 other countries, people are holding a #WikiGap event, trying to get more women to add to the free online encyclopedia, Wikipedia. Right now 90% of the people who work on Wikipedia are men. In Spain, around 5 million women and female students went on “strike”. They did not work, go to classes, or buy things. They wanted people to notice how important women are. One result of their strike was that 300 trains could not run. An important meeting between US President Donald Trump and North Korean leader Kim Jong-Un ended suddenly on Thursday when both sides decided they could not agree.